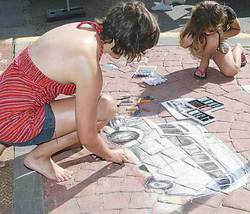 Young Sam Sawyer watches in fascination as Jenna Mortemore creates a work of art on the sidewalk for all to enjoy as they wander through the vendors at the Summer On Main Street Event. Leduc – As we all know, summer in Alberta is a fleeting thing and something everyone tries to make the most of, which was part of the idea behind the "Summer On Main Street" series of events the Downtown Progress Association (DPA) put on this year. The DPA is a group of downtown business owners dedicated to promoting and improving the area known as the Main Street Shopping District in Leduc which is primarily along 50th Avenue from 47 St. to 50 St. So this summer this group of innovative thinkers are running a series of seven events, each held on a Saturday, that bring music, art, entertainment and vendors to the older part of downtown to encourage everyone to take a walk along Main Street and enjoy the sights and sounds of a more historic part of Leduc. This last Saturday's event couldn't have asked for better weather to encourage strolling. A gorgeous sunny afternoon set the perfect backdrop for a leisurely walk along 50th Avenue to grab an ice cream cone from The Crockery and take a peek through the vendors tents set up in the Bank of Montreal parking lot. Homemade crafts were on display and available for sale, Epicure spices tempted the taste buds, the Black Gold Quilters were busily stitching together a fabric work of art, and Kosmos Kitchen had their mobile van there sending up scrumptious scents into the warm summer air, amongst other offerings as well. The Jim Findlay Trio had everyone's toes tapping and kids were running between tables checking out all the wears with their multicoloured face paintings and balloons in tow. As you travelled west down Main Street and you reached the Black Gold Art Gallery, walkers were treated to violinist Mitchell Chalifoux playing alongside an artist seated along the sidewalk, in the process of creating a graphic art piece outside in the fresh air. Alongside of the tented vendors all the unique, locally owned shops along Main Street were open and ready to serve as well. This was the fifth of the Summer On Main Street events with the final two taking place on September 7th and 21st respectively, with the location of the vendors changing to the intersection of 50 Ave. and 48A St. The entertainment changes from event to event as well so there are always new experiences to be had each Saturday. The events only run from 11am until 2pm but it's a lovely way to spend a little time on a sunny Saturday reacquainting yourself with the heart of Leduc.